Madras boys basketball, 3-3 in TVC, needs end-of-season victories to make playoffs. Madras boys basketball lost to a now 5-15 overall Estacada 89-83 team Tuesday, Jan. 29, but turned things around with a huge 79-54 win over Corbett at home Friday. The win over Corbett (8-11) kept Madras (3-3 TVC) in the hunt for the postseason. The Corbett game was close at the start, tied 6-6, but the Buffalos went into the second quarter with a seven-point lead. Donnie Bagley made a 3-pointer to start the second quarter and Byron Patt made a pair of free throws and a 3-pointer himself. Corbett called a time out and Madras had a 23-8 lead. Dapri hit back-to-back 3-pointer for the Buffs and Madras has a huge 21-point lead. The Buffs outscored the Cardinals 27-16 in the second quarter and went into the halfway break up 42-24. The second half was highlighted by two dunks by Madras. The first a fast break slam by Chapin Grote and on the next play, Patt drove to the hoop and stuffed it down with one hand. "That dunk sealed my dream goal, it was really big for me," Grote said about his first varsity dunk. "Those two dunks put us on the highest pedestal on earth." The win kept the postseason hopes alive with only four games left in the season. "We came out ready to go and knew we needed this game for keep our playoff hopes alive," Grote said. "We came in firing and filled it with intensity and energy. We need people to step up and be energizers. It is all about confidence with us. Once we have that confidence and swagger, the team gets rolling and nobody can stop us. We need to win and then win and keep winning." Patt led the way with 23 points, while Grote and Miller both added 14 points. Madras was able to make 14 3-pointers on the night. 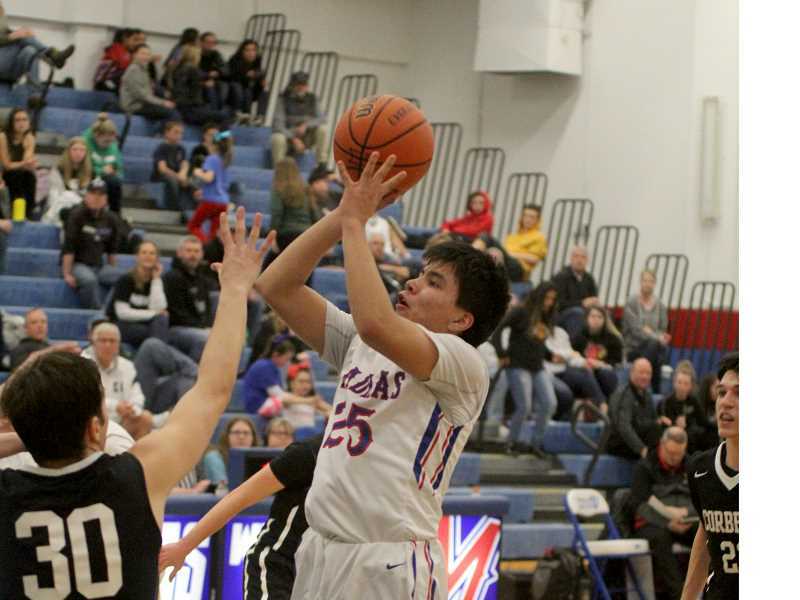 The White Buffalos boys basketball team had the lead almost the entire game over the Estacada Rangers Tuesday, but were outscored 28-17 in the fourth quarter and lost 89-83. Dropping the game in Estacada moved Madras to 2-3 in the Tri-Valley Conference. Mitchell hit a 3-pointer to start the game, but Estacada was able to go on a 9-0 run before Herkshan knocked down a three to kickstart a Madras run. Miller hit back-to-back threes and Patt made his way to the hoop, giving the Buffs a five-point lead. A few plays later, Bagley hit a 3-pointer and the Buffs ended the first quarter with a 19-14 lead. The Ranger hit a 3-pointer, closing the gap to one possession. Mitchell scored five points in a row for the Buffs, but Estacada was keeping pace. Calvin Drydren hit a big three for the Rangers, but Bagley was able to score for Madras, while Patt knocked down a three and Miller made a pair of free throws. Madras then found themselves with a nine-point lead, but Drydren hit another deep shot for Estacada, to give the Rangers some momentum. A Herkshan bucket extended the Buffs lead again before the hot shooting of Drydren continued with another make from behind the arc. Grote and Patt both knocked down 3-pointers for the Buffs, but the Rangers answered again with a deep shot and Madras had a 40-31 lead halfway through the second quarter. Near the end of the quarter, Patt hit another 3-pointer, but the Rangers went on a 7-0 run to end the quarter. Madras went into halftime with a 46-39 lead. After Estacada scored the first points of the second half. Madras went on another 9-0 run, extending their lead to 14. Nick Keller scored twice for the Rangers, but it was matched by a Jorgensen basket. The Rangers called a timeout down by 11. 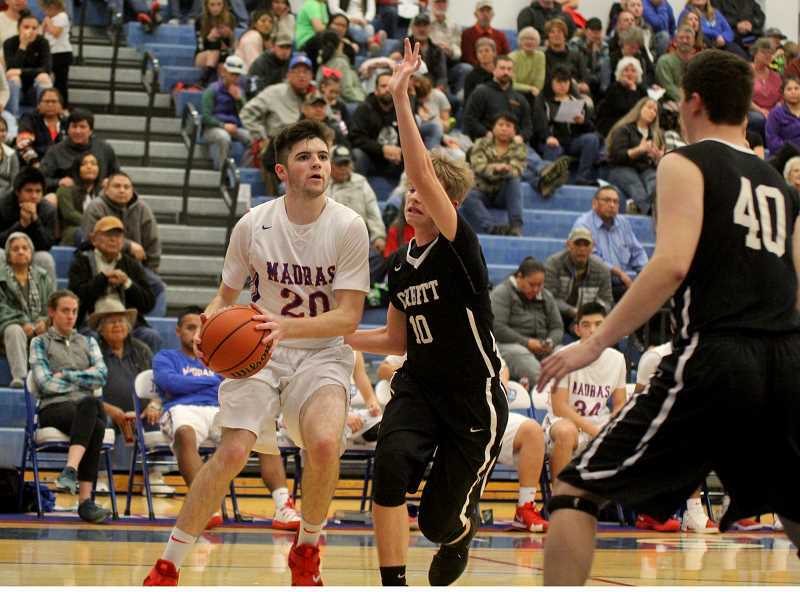 Madras and Estacada battled throughout the third quarter and Madras kept an 8- to 12-point lead until the Rangers scored the last five points of the third quarter. The White Buffalos went into the fourth quarter up 66-61. Nathan Hagel scored for the Rangers to start the last quarter of play, but Herkshan knocked down a 3-pointer to start things for Madras. Estacada went on a 6-0 run, four points off free throws, and the Rangers tied the game at 69-69, prompting Madras head coach Evan Brown to call a timeout. The Rangers extended their lead to four, before Heath made a pair of free throws, keeping the game close. A few plays later, free throws by Bagley and Rhoan with a basket by Mitchell tied the game at 75-75. The Rangers again took a four-point lead, until Patt made a pair of free throws. But Estacada was just good enough from the free throw line to keep the Buffs from again tying the game. Patt hit another three and the Buffs were down by two with less than two minutes of game time left. With a mix between free throws and Drydren and Keller, Estacada extended the lead to eight. Patt hit another three near the end of the quarter, but the Rangers were able to close out the game. Madras was able to score 39 points on 13 made 3-pointers, but the Rangers kept pace with the 3-pointers, making nine of their own. Maybe the key to the game, Madras shot just 56 percent from the free throw line and Estacada was able to shoot 71 percent from the stripe. The White Buffalos had four players in double digits with Patt leading the way with 20 points. Herkshan was behind him with 18 points, while Mitchell added 12 points and Miller ended the night with 11 points. "They shot 74 percent in the game and a lot of that was our lack of energy," head coach Evan Brown said. "Early on we were able to create stops and had a big lead. We missed an easy bucket in the third and the team was in the middle of weathering a storm. They go down and bank in a shot at the end of the third quarter, which was a huge swing and our heads go down and that was game, set, match." Madras travels to North Marion to take on the No. 13-ranked Huskies on Friday and are back in the Buffalo Dome to face No. 8-ranked Gladstone on Tuesday. "The whole key is energy," Brown said about staying consistent. "It has to be there and if we don't sustain that in the next couple games, we will have a nonexistent postseason. It is early to tell, we can finish anywhere from second to fourth in league right now, but we also have to be ranked in the top 20 with the change in the play-in games." "We thought winning four out of our last five games were give us a postseason game," he said. "Now it is three out of the last four games."